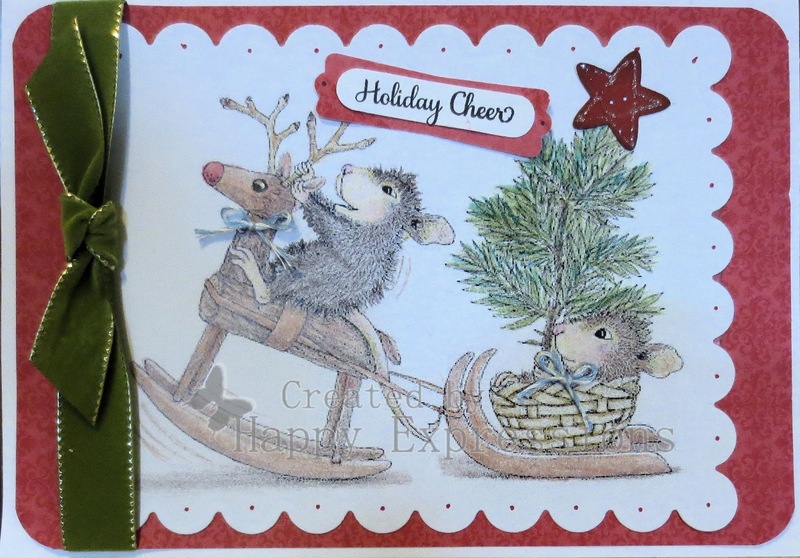 I'm back with a house mouse card this time. They are so adorable, I couldn't resist coloring it. I used the spectrum noir color pencils. It is more vibrant in real life and I am disappointed that my camera hasn't picked up its beautiful colors. The designer paper is SU from a few years back. The image was printed onto neenah cs. I decided to use a die cut to give the card more interest. I then used a red pen and added dots onto the scallop edging. The ribbon is also SU but it had to have a knot other wise it was just too bulky for the card. I cut the button with the buntings and buttons die in the star shape for the top of the tree. I distressed the star with cherry cobbler SU ink. The sentiment is from the Just Rite stamp set Noel Christmas Ornaments. It is a beautiful set. I used the SU modern label punch and the word punch to use with the sentiment. It is just glued on. I took a liner and outlined the reindeer eye. I added the black and the white twinkle so he looked more awake. I couldn't find my red or green twine so I used blue to make the bows for the reindeer neck and the mouse in the basket. I used a half inch corner punch on the designer series paper. I hope you enjoyed seeing my card, and feel like leaving me a comment. House-Mouse and Friends- Bingo - I used a button, ribbon and bakers twine. Thank you for stopping by and have a fabulous and happy day! Oh I know what a pain cameras can be...beautifully done Carol!! Thank you for sharing with us at House Mouse and Friends Monday Challenge! What a fun image, and colored up beautifully. The scalloped card and ribbon look great too. Thanks for joining us for the House Mouse and Friends Monday Challenge. Adorable card...would love for you to enter our challenge at Classy cards 'n Such. The theme is Deer Season.....the inlinkz can be found on my blog www.nelliesnest.blogspot.com Hope to see yu there! Absolutely gorgeous card! Love the added ribbon. Thanks so much for joining us at House Mouse and Friends Monday Challenge. Hope to see you again on the next challenge! Such a sweet image and lovely card design. Glad you played along with HMFMC!!! Awww such a cute wee image & lovely colouring & design nice work..
Adorable image and card. Thank you for sharing with us at Gruffies & Guests Challenge. Fabulous card and thank you for joining in our challenge at Gruffies and Guest "Make it Fruity” with the option of “Anything Goes” good luck and hope to see you again.